Results of investigations using a pin contact shear wave ultrasound transducer performed at specimens prepared by BAM, Berlin, and BASt, Bergisch-Gladbach, are presented. These specimens with different percentage of ordinary reinforcement contain ducts which are partially filled with grout. The aim of investigation was to check the capability of the applied technique to find areas of unfilled ducts and to apply advanced statistical techniques of interpretation. The results show that the disturbing influence of ordinary reinforcement at least up to the percentage represented by the specimen under consideration is not an obstacle for the practical application of the technique. The influence of reinforcement can be derived from parallel experimental investigations. Using post tensioned simply supported and continuous beams is the dominating technique of bridge building during the last fifty years. The basic idea is to produce compressive forces within a beam by prestressing strands anchored at both ends of the beam. These strands are guided by pipes which are embedded in the reinforced concrete beam. These pipes are called ducts. A bond between the strand and the beam is performed by filling the remaining volume in the duct with mortar after having prestressed the strands. This mortar filling leads to a bond between duct and strand. For the duct is embedded in the surrounding concrete there is a rigid connection between the prestressing cable and the beam. The requirements a prestressing cable material has to fulfil are different from those applicable to ordinary reinforcement. The yielding point is significantly higher and the relaxation is lower than the corresponding values of ordinary reinforcement. Fulfilment of these requirements leads to a material, which is sensible to certain types of corrosion. This sensibility doesnt play a role as long as corrosion protection is guaranteed by a basic concrete environment, i.e. the grouting which also provides the bond between duct and strand, resp. the beam itself. It was found out that the proper filling of the ducts was not achieved in some structures. That means, there is a probability of failure of the strands and therefore a high risk for the stability of the structure itself. It is obvious, that such a risk is increasing with the lifetime of the building and that it is impossible to perform an area covering inspection based on destructive methods. There is a need for non-destructive techniques on a reasonable cost level and with a sufficient accuracy indicating areas of improper filling under practical circumstances like ordinary reinforcement hiding the ducts. The existing methods for the detection of voids in ducts shall be reviewed in brief. X-ray application is by far the oldest techniques applied to the problem described above. The detectability of voids is based on the difference in the length of scattering and absorbing material in the path of the radiation. An image is produced and the amount of energy received in different areas of the image can be used to recalculate the effective thickness of the corresponding material. Unfilled ducts can be detected. The method needs accessibility from both sides of the structure; its a transmission technique. Inspection areas are relatively small and the need for sufficient radiation protection is often a severe problem. Interpretation of the x-ray-"pictures" is often not as easy in practical applications as it seems for simple laboratory set-ups. 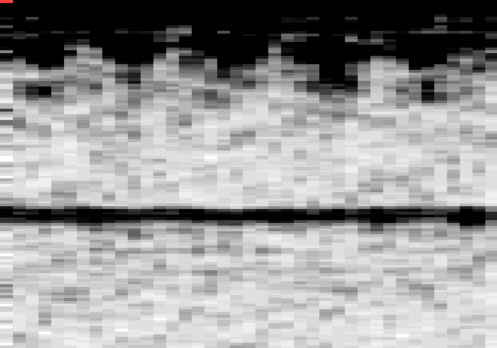 Ultrasound and low frequency sound (up to 60 kHz) of impact echo interacts with the differences in density and Youngs modulus of the material it passes through. Insofar these methods based on elastic waves are obviously favourable to detect voids even in the metallic ducts. Both methods can be used in reflection techniques needing only a single side accessibility; in practical testing situations this is a very important fact. RADAR and magnetic methods are not applicable because of the metallic ducts causing a shielding effect. Concrete is an extremely inhomogeneous medium, causing a large amount of backscattering for elastic waves, which leads to "grain noise". The relationships of grain noise and detectability for longitudinal waves are reported in detail in [1, 2]. It was found out, as reported in , that shear waves application offers advantages with respect to backscattering in direction of the receiver. Figure1 illustrates this fact. The following report refers to the application of shear waves to the problem of void detection in ducts. Fig 1: P-waves and S-waves. Compressional waves (L-waves, P-waves) in their traditional application need a coupling agent allowing the transfer of pressure from the surface of the transducer to the coupling agent and then to the concrete surface. Only after this transfer mechanical waves are released to the concrete volume. The same is true for the receiver. The coupling agent has to provide energy transfer and has to " smoothen" the usually rough concrete surface to fit it to the transducer surface, which is perfectly flat. A series of coupling agents and techniques had been tried out . Shear waves can be transferred to concrete surfaces and to the volume under inspection by point contacts, moving parallel to the concrete surface. As long as there is a transfer of forces parallel to the surfaces there is no need for a coupling agent. Beside the advantage of averaging a large number of single measurements to improve the reliability of the result in total, there is the chance to produce "pictures" and to include all types of additional preinformation, which will be discussed next. The objective of the experimental investigations presented in the following chapter is the detection of ducts, in the next step the detection of areas which are not filled with grout and the application of statistical methods giving quantitative information about the probability of false alarm. This term is explained more detailed in . As pointed out above, the ordinary reinforcement near the accessible surface for reflection measurements plays an important role in the detectability of ducts and unfilled areas in these ducts. Strong reinforcement has a disturbing influence on the quality of the measurements. The capabilities and the performance of shear waves with point coupling to the concrete surface  was reported in  in detail. The specimens under investigation in this report had been concrete blocks of different maximum aggregate size and drilled holes with a diameter of 80 mm. Consequently the next steps for investigation had been structures with different types reinforcement and ducts with well controlled areas of improper filling. Corresponding specimens are available at the Bundesanstalt für Materialprüfung (BAM) in Berlin and the Bundesamt für das Straßenwesen (BASt) in Bergisch-Gladbach. Both specimens are carefully produced and the conformity with the documentation was proven by x-ray investigations. The test specimen of BAM, as displayed in figure 2, has a volume of 2.0 *1.5 *0.5 m3 with a metal duct diameter 85 mm. Maximum aggregate size is 8 mm the concrete has a strength category B45 using cement HOZ35L. 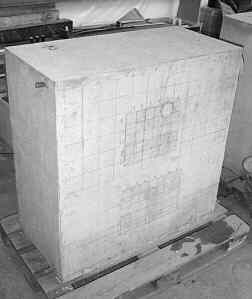 The measured area of the specimen is free of reinforcement and has a smooth formwork surface. When cement was injected to the duct, intentional voids were created with rigid foam. The test specimen of BASt, as displayed in figure 3, has a volume of 2.0 *1.5 *0.68 m3 with two metal ducts diameter 85 mm. Maximum aggregate size is 16 mm the concrete has a strength category B45 using cement CEM III/A 42,5. The specimen is divided in two halves of the kind of mesh reinforcement; area 1 (left) mesh size is 50 *50 mm on both sides, area 2 (right) mesh size is 75 *75 mm on both sides. 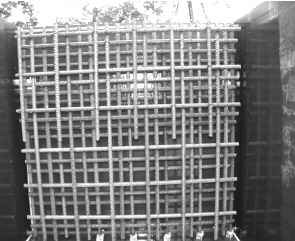 The diameter of the rebars is 12 mm. The improper filled areas in the ducts are made by plastic flaps (PE) and around the first duct are two artificial honeycombs. Fig 3: Test specimen BASt. The following results of measuring are presented in layers parallel to the accessible surface called C-Pictures (figure 4). Figures 5 and 6 are presenting C-Pictures of the specimen of BAM. Area 1 and 2 are composed in every picture. Figure 5 clearly shows the reflection of the duct and of the drilled hole. The differences in the intensity of the greyscale in the range of the duct point to distinctions of the filling. In the case of the drilled hole in the upper part of the picture indicates, that the upper surface of the hole is not perfectly parallel to the inspected surface. Stepping upward in z-direction proves this assumption. So very dark areas represent the improper filling as shown in the specimen sketch. In figure 6 the dark areas are belonging to the back wall and the bright areas to the duct and the drilled hole. Those bright areas are reasoned by the shadowing effect of the duct and the hole. Beside that there are scattering obstacles in the specimen which are not indicated in figure 2 producing also shadowed areas on the backwall. Figure 7, 8 and 9 are presenting C-Pictures of the specimen of BASt. The left and the right area of the measuring are composed in every picture. Fig 7: C-Picture of BAST specimen depth z = 287 mm. Fig 8: C-Picture of BAST specimen depth z = 362 mm. Fig 9: C-Picture of BAST specimen depth z = 687 mm (back wall). Figure 7 shows the layer in the level of the upper duct. The dark areas are results of the honeycombs and the improper filling. In the same way figure 8 presents the layer in the level of the lower duct with dark areas resulted by improper fillings (see specimen sketch). The back wall level is presented in figure 9 showing the shadow effect by the two ducts. A standard measurement provides 40 (x-direction)* 24 (y-direction)* 128 (z-direction) = 0.123 megavoxel data points. The physical volume of each voxel depends on the step width in x and y-direction and on the depth of the specimen. A reasonable physical volume for a concrete slab of 50 cm thickness and x, y-steps of 2cm is 1.6cmł. 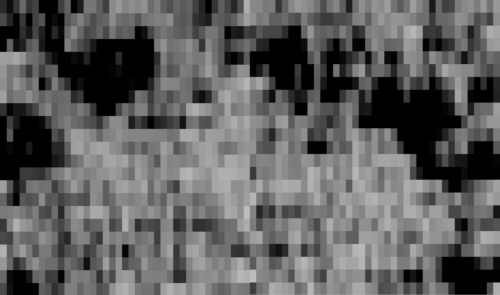 This set of data allows the display of all possible planes within the volume. Reasonably for simplicity of information planes parallel to the accessible side ("inspection side") or perpendicular to this in the direction x or y are regarded. The first type of display is called C-picture as presented above. All reflecting structures i.e. 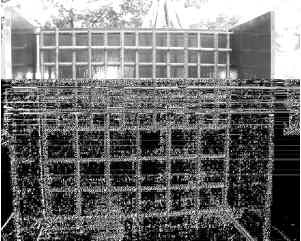 rebars, ducts - in the observed case - and the backwall should be observable in the corresponding depth. 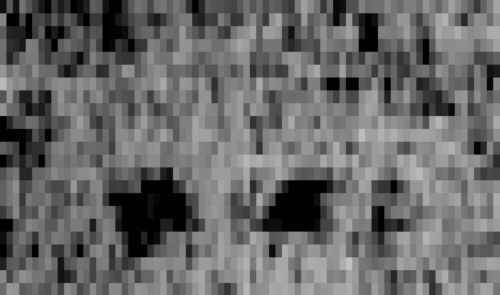 Dark areas in the pictures indicate high intensity of reflected waves, light areas indicate low intensity. The interpretation of results can be separated roughly in two steps: finding out the position of reflecting objects and the explanation of different intensities within an identified object. In fact these two steps cant be separated perfectly in most practical cases localising a scatterer already means taking into account the differences of intensity. In the introduction the inhomogeneous nature of concrete was pointed out and the consequential grain noise. That means, different to the optical image of a structure like a duct, there will be a surrounding of the object under observation whose intensity level is not much lower than that of the object. Major scatterers in a concrete volume will produce shadowed areas on the backwall because there is a reduced intensity of the incident waves. These shadowed areas must correspond to reflecting areas in planes parallel to the accessible surface (C-scan). If both statements are found to be true, the existence of a scattering structure - in the case under observation a duct - can be assumed strongly. Differences in the reflectivity of the structure indicate differences in density and/or Youngs modulus of the scatterer. Those differences in the case of ducts must be a consequence of proper or improper filling with grout. 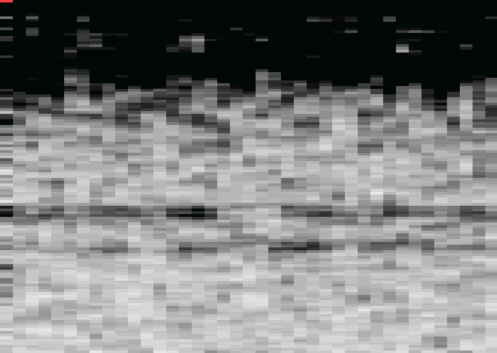 A comparison of the sketches indicating the positions of improper filling and the corresponding ultrasound pictures shows a remarkable consistence. This consistence is obviously not strongly influenced by the reinforcement of the two specimen under consideration. Statistical methods are the most reliable mean to provide proper distinguishing between background and scatterer of interest. These methods are described in detail in [diss. jansohn]. A first simple check for the applicability of the strategy is the comparison of the intensity distribution of different characteristic areas of the pictures presented above. A significant difference of the mean values of the Gaussian distributions representing the background, the well grouted and the improper grouted duct is the first requirement for the applicability statistic methods of interpretation and especially for the definition of a reasonable threshold to separate the different intensities. Based on this threshold the probability of false alarm can be defined. Figure 10 shows the result of such a proceeding as an example. This is an important step towards an objective interpretation of ultrasound measurements. Fig 10: Gaussian normal distribution (BAM specimen, area 2, z = 337 mm). Following the underlying distribution figures 11 and 12 are the transformed results by putting the threshold between "Filled" and "Surrounding" (figure 11) and between "Improperly Filled" and "Filled" (figure 12). This leads to displaying the duct in total including filled and improper filled areas and in the second case only the improper filled areas are shown. Fig 11: Transformed C-Picture of area 2 threshold between filled duct and surrounding. Fig 12: Transformed C-Picture of area 2 threshold between filled and improper filled duct. Following the argumentation given in the previous chapter the detectability of the backwall is a good indicator also for the detectability of scatterers within the concrete volume. At least a shadow will be recognised as long as the backwall is presented by significant signals. The influence of extremely high percentages of reinforcement to the detectability of the backwall is investigated up to 4 layers of 16mm rebars with a spacing of 10* 10cm. The measurements were performed at concrete specimen with specific amounts and configurations of rebars used in practice, as can be seen in figure 13 and 14. The length of the specimens is 100 cm. The width is 49 cm. The height is 100 cm (figure 15). The maximum grain size is 16 mm. The lower half of the first specimen has one layer of reinforcement (the one layer region). Its upper half has two layers of reinforcement (the two layers region). The lower half of the second specimen has three layers of reinforcement (the three layers region). Its upper half has four layers of reinforcement (the four layers region). The diameter of the rebars is d = 16 mm. Fig 13: Specimen 1. Fig 14: Specimen 2. Fig 15: Size of specimen. Figure 16 and 17 show the results received from the measurements with the A1220 as B-Scans. At the one layer region the backwall can clearly be detected. With increasing reinforcement content the detectability of the backwall decreases. At the four layers region the backwall can hardly be seen. Fig 16: B-Scan of specimen 1 with one layer of reinforcement. Fig 17: B-Scan of specimen 2 with four layer of reinforcement. Corresponding results are also shown at figure 18 and 19. 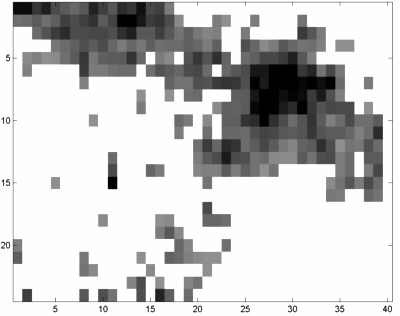 The A-scan graph in figure18 is gained from an average of 40 A-scans, measured to display the B-scan shown in figure 16. 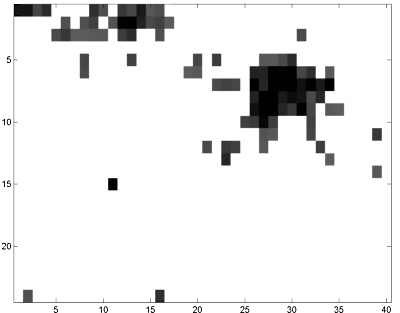 The A-scan graph in figure 19 is the averaging result of the data presented in figure 17. Fig 18: A-scan: Backwall of the specimen with one layer of reinforcement. Fig 19: A-scan: Backwall of the specimen with four layers of reinforcement. In both graphs the peaks showing the reinforcement and the backwall are detectable. Dotted lines assign the height of the backwall peak and the surrounding noise level. The signal-to-noise ratio of the backwall in figure 18 is approximately 14 dB. 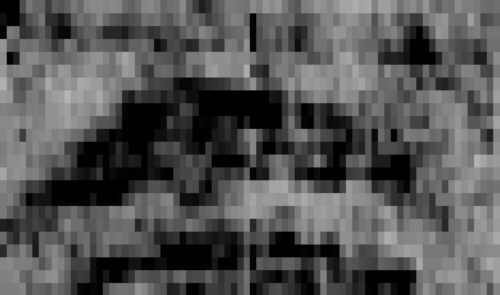 In figure19 the signal-to-noise ratio of the backwall is approximately 6 dB. The signal-to-noise ratio of 6 dB is considered as the threshold for the detectability of a signal. The particle vibration generated by L-waves takes place in the direction of the wave propagation. At inner interfaces a wave is scattered primarily forward and backwards. Whereas the S-waves generate a particle vibration perpendicular to the direction of their propagation. The same is true for the direction of scattered waves. The differences in the reflectivity of filled and unfilled ducts embedded in concrete with a thickness up to 70 cm proved to be detectable by S-wave reflection technique. The distorting effect of different percentages and arrangements of ordinary reinforcement was assessed. Statistical evaluation of intensities obtained by the measurements indicate that it can be distinguished clearly between plain concrete, filled and unfilled duct. The data capturing speed of about 1000 points per hour using a dry contact pin array allows the investigation of structures in the field with reasonable expenditure.